Let’s start with the beyond talented Kimberly Geswein Fonts. KG PRIMARY PENMANSHIP and KG CORNER OF THE SKY. Both perfect manuscript prints. 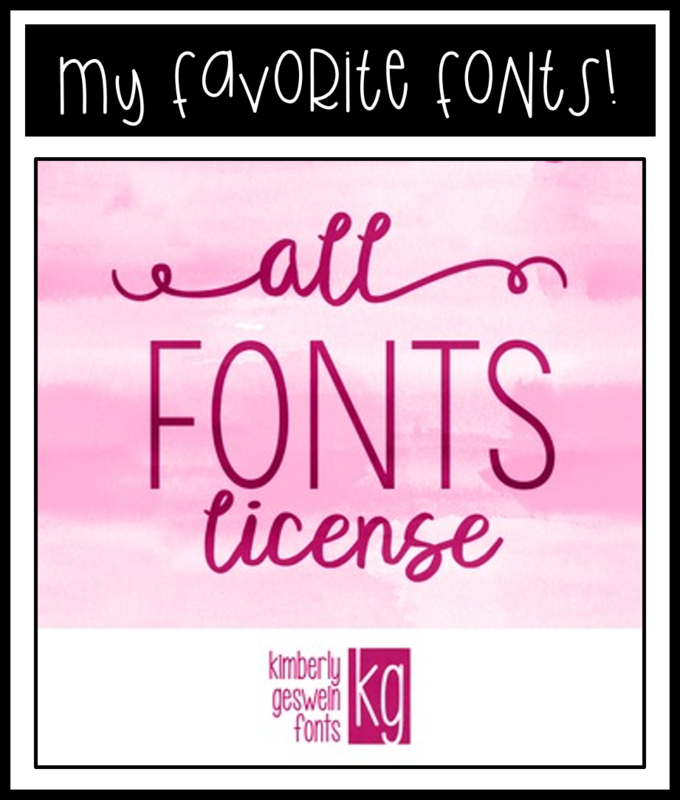 If you’re creating products and materials to sell, her ALL FONTS LICENSE is well worth it!!! 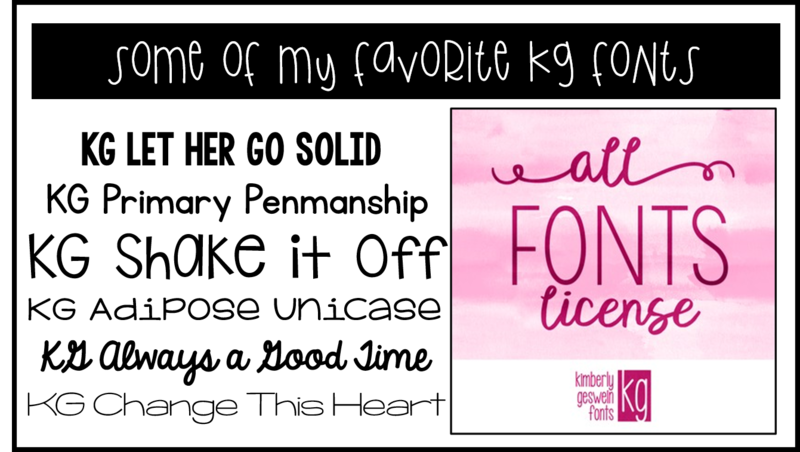 These are some of my most favorite KG fonts. These aren’t the only fonts of hers I use, but I find myself gravitating toward these particular fonts more frequently than others because they seem to work well with everything. 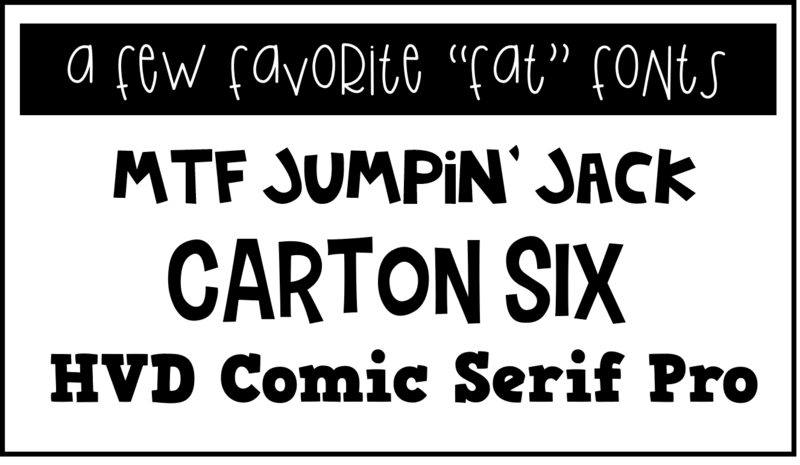 I’m extremely partial toward LET IT GO SOLID because it’s an amazing “fat” font that can be used for SO many things! Next up is my dear friend, Abby. You may know her better as Babbling Abby from The Inspired Apple. Let me just tell you how excited I was when she started creating fonts!!!!!! I find myself using Abby’s fonts ALL.THE.TIME. She has such a huge selection of fonts from which to choose that it’s easy for me to find a “just right” font for anything I’m creating. They’re easy-to-read, clean, whimsical, and well…just plain brilliant!!!! Although Abby has several different font volumes available, I would HIGHLY recommend going for the bundle. She has TOO MANY great fonts that are spread out in different sets that it’s impossible to choose just one or two. I had to have the bundle because I seriously LOVE THEM ALL!!! I mean, this is just a teensy sample of what the bundle holds….and they’re all SO dang good!!! I’ve been using Babbling TpT Orlando a TON lately…that’s the font you see at the top of each heading. Isn’t it amazing?! And it’s FREE!!! You won’t regret owning her fonts for a second!!! I kept seeing the COFFEE BEFORE TALKIE font everywhere and when I found out where it came from I had to have it!!! And wouldn’t you know that ALL of the fonts in this set are just as amazing?! Crisp , clean, and easy-to-read. They really are a great set to own!!! See what I mean about the COFFEE BEFORE TALKIE font?! Isn’t it awesome?! Although the fonts are insanely adorable, I think my favorite part of her sets are the names!!! SO darn clever!! Here are a few random fonts I happen to love and adore, too. MTF Jumpin’ Jack is the one I get questions about most frequently. This one is a Miss Tiina font and I think the print just speaks for itself. LOVE! Carton Six and HVD Comic Serif Pro area also great “fat” fonts to have in your arsenal. 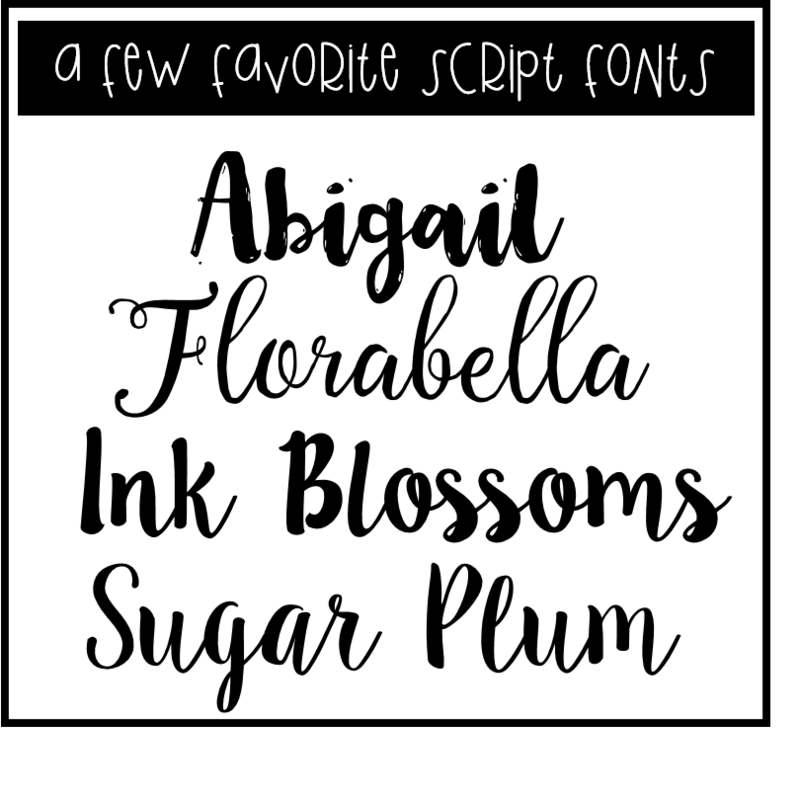 I love a good script font and these are my most favorite and most frequently used….
. These pair really well with so many other fonts. And just to give you an idea of how well these fonts pair with one another, I wanted to share with you some of my favorite pairings!! So there you have it! My favorite font artists, my favorite fonts, and some of my favorite pairings. Of course, there are a ton of fonts that pair well together, but that’s the subject for a whole different post, LOL!!! Do you have any go-to font artists you love? Any fonts you can’t live without?! I’d love to hear more!!!! Such a great post! Thanks Cara!! This was a great post. I am always wondering which font looks good with another font.Thank you for the much needed information. Oh great! So glad you found this helpful!! I always love seeing the way other people pair their fonts, too!!! I'm a KG girl too. Hers are amazing. 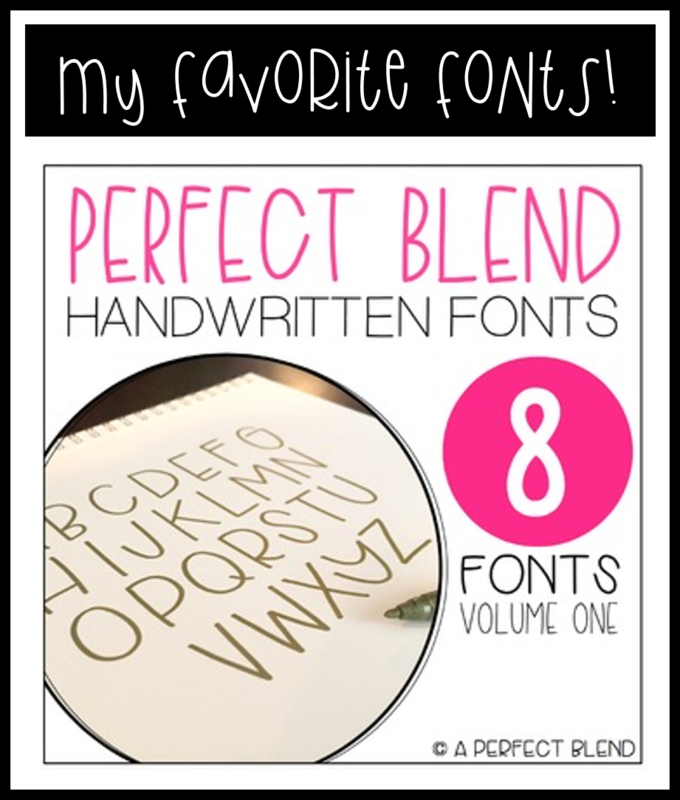 I recently found HelloFonts on TPT and am UH-bsessed! Thank you Cara for introducing me to new artists and their fonts. The pairing guide is a huge help! You have fed my font addiction even more. Not sure whether I should thank you or blame you! Hmmm….ok I thank you! 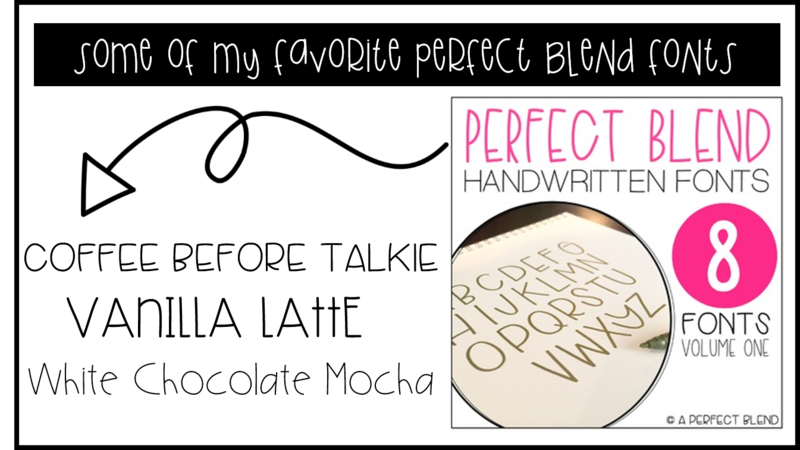 Love these fonts! I've loved KG for a while. It's exciting to find out about some new ones, too. I recently found GraGraphics from the Pond. She has some great freebie fonts (even for commercial use). This was an awesome post! Thank you so much for putting all of this great information together. I will definetly be on the look out for some of these fonts. Love this post!!! Do you know which google font would closely match jumpin jack? No, I sure don’t!!! I’m so sorry! Wish I could be more help!